Charlotte Wingfield is seen second from right. Updated: Charlotte Wingfield was eliminated early this morning after winning her women’s 100m preliminary race at the Olympic Stadium in Rio de Janeiro yesterday. 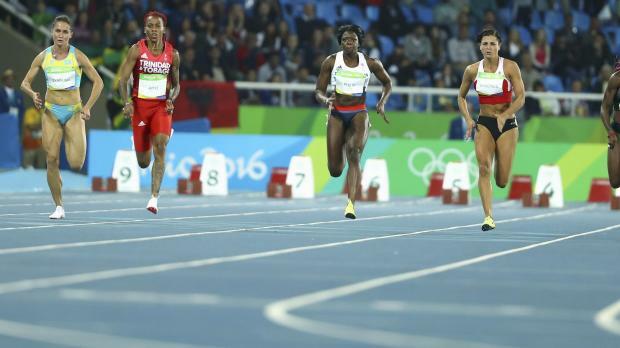 The 21-year-old placed last in the race, clocking 11.90 seconds. Michelle-Lee Ahye raced to first spot in 11 seconds. Yesterday, Ms Wingfield, placed first in 11.86 seconds to book her place in the first round. Wingfield’s time was 0.17 seconds outside her own national record of 11.69 she had set during the European Games, in Baku, last year. Cardiff-based Wingfield became the second Maltese runner to make it past the opening round of the women's 100 metres race in the Olympic Games, following in the footsteps of Diane Borg had also made it through the preliminary round in London 2012. Swimmer Nicola Muscat placed sixth in her 50 metres freestyle heats at the Acquatic Stadium. The 22-year-old touched home in 26.60 seconds, 0.5 seconds slower than her own national best of 26.19 she set at the Tal-Qroqq National Pool last year. Karen Torrez, of Bolivia, won the heat in 26.16 seconds. Weightlifter Kyle Micallef was in action in the 85kg category and he finished last after he failed to complete the competition.